Maintaining Financial Sanity through Life Transitions. A bit over a year ago, I gave my first presentation as a (future professional) public speaker. Last month, I received a speaking fee check that was – for the first time – in the full amount that I had requested from my host. While I have certainly grown as a speaker in the intervening year, the biggest lessons I’ve learned have been as a new entrepreneur in this arena. Today I’ll tell you the top things I wish I had known at or done well from the start of this business. Most of these lessons are applicable for any service-based entrepreneur, though some are specific to speakers. Oh, also, I’m not trying to say I’m super successful by this point or anything. I’m not working as much as I want to be (yet) or charging the fees that I want to be (yet). But when I look back on the past year, I can see that I’ve learned a ton, and I’m proud of the progress I’ve made. The talk I’m almost always hired for is the first one I created for this business, The Graduate Student’s Guide to Personal Finance. It is great presentation, and it has been right from the start. It’s not something I threw together the weekend before I gave it the first time. I probably put 100 hours of work into it before my first engagement, and leading up to each subsequent event I update, tailor, and rehearse the presentation for another 5-10 hours. The benefits of having a fantastic product right out of the gate are two-fold: First, I would be comfortable referring potential clients to any of my previous hosts because I know they would give me positive reviews (and I have been asked for complete lists). Second, I have no trouble selling/pitching this product. I am not a natural salesperson – I’ve hated selling back to my Girl Scout day and avoid other salespeople like the plague – but because I believe in myself and my message and my delivery so thoroughly I can easily convince others of the value of this product. Even individuals who turn me down over the event cost almost uniformly express support for my business and regret that they cannot bring my product to their audience. I don’t speak about anything to anyone. I have a narrowly defined target audience and subject matter. This is a double-edged sword, but one I am comfortable with. I speak to early-career PhDs on what they can do while they are still in training to improve their finances. Each one of my presentations has an even more narrowly defined audience (prospective stipend-receiving graduate students, stipend-receiving graduate students, or postdocs) and sometimes subject matter. In my case, my audience and customer are potentially different groups. Sometimes my hosts are graduate student government groups who are identical with my target audience and sometimes they are administrators who serve my target audience. To date, I’ve only spoken at academic institutions, but in reality that is only one avenue by which I might reach my target audience. At the majority of institutions I’ve contacted, there is a need for my product. Some potential customers have turned me down while citing sufficient existing resources, and that’s probably true in a few cases. But as far as I can tell no one is serving my target audience in the way that I am at a cross-institutional or national level, so if the need is being met it is only at scattered places. Some of my customers had recognized their need before I spoke with them, and some were convinced it through our conversations. This is a productivity suggestion! I used to spend a lot of time writing emails for a few potential clients. I still spend a lot of time on email, but now I’m in correspondence with many more potential clients. My emails also used to be pretty unsuccessful in creating conversions. I think I’ve become more professional in my email correspondence over the last nine months. I have a 150-word pitch email that I used when emailing a potential client cold. The pitch email briefly explains who I am and what I do and asks the reader if his/her group is a potential host. I attach a flyer to the email that contains more detail about the presentation content, reviews from previous hosts, and a short bio and picture of me. The flyer points the reader to my website, which I also list in my email signature. The website contains even more detail of the type on the flyer. The idea here is to not overwhelm the email recipient with a block of text, but to leave breadcrumbs for an interested person to find more information. I’ve had this pitch email and bonus content in use for about six months now and it’s saved me a ton of time. All I have to do when I send it is to identify a viable host to be the recipient and fill in three fields in the template. Another way that I’ve dramatically cut down the time I spent writing emails is to get potential clients on a video or phone call as soon as possible. The amount of information I can convey in a 30-minute phone call would probably take an entire day of email-writing (and then it wouldn’t be read!). Oh, and one last note – another thing I changed when I professionalized my approach was creating a separate business email account. That helped people take me more seriously as a business owner. When I went to FinCon14, I attended a session on professional public speaking, and this point was one of my major take-aways. I video recorded the first three presentations I gave and edited them into short sample clips, which I posted on my website. The quality is not good, but it’s far, far better than having nothing at all. Upon request by a potential client, I will also share a recording of an entire presentation. The great thing about sharing video from live presentations is that your potential clients can see how you really perform and even handle answering questions, which adds a lot of credibility. Oh, and I did not know the first thing about editing video when I started this process, and I have a pretty slow learning pace when it comes to software. But I’m quite comfortable with the limited scope of editing that I need to do now that I’ve practiced it a lot. The question of whether to publicly post speaking fees is hotly debated. As of now, I do not post my speaking fee schedule online. I have a page that basically just asks potential clients to contact me directly. I have a standard speaking fee schedule. I used to ask for a flat rate for any presentation, but after reflection and consultation decided to scale my speaking fee with audience size. I think this sounds more palatable to my potential customers. I also have a standard set of discounts that I offer when they are called for or a potential customer asks for one. I am planning to revamp this schedule once again for the 2016-2017 school year to reflect even more nuances in the products. After a potential client responds to my pitch email, I try to get him or her to have a live conversation with me as soon as possible. I shine in these calls. My passion for my audience and subject matter comes through 100x more clearly when I use my voice rather than text. In addition to a verbal conversation being way faster than email, as I stated above, it’s a much more efficient exchange of information. We can have an easy back-and-forth of questions and answers, and I can make sure that each point I make or hear is clearly understood. Almost everyone I get to have a full conversation with me comes away telling me that they are going to try their best to bring my product to their university. However, there are some potential clients who are difficult to get on the phone, either because of logistics or skepticism. Just two months ago I finally found a way to put my passion on display for these people: a video description of The Graduate Student’s Guide to Personal Finance. I basically just recorded the five-minute walk-through of the presentation that I share with potential clients over the phone. The video recording is actually even better than the live summary because I added in still images of about 50% of the slides I use in the presentation. That part of the call tends to be pretty monologue-y anyway, so I’m not losing much by pre-recording it, and so far it’s been quite effective so far in moving potential clients closer to a booking. I gave my first two talks for free at universities that were local to my area. What I gained from these events was: experience, recordings, and references/reviews. After that, I started asking for money. No one was willing to pay me what I asked, so I gave four more presentations for free, travel expenses, or a fractional fee. At that point, I started presenting myself more professionally and became more firm about my rates. Unfortunately, many interested potential clients cannot afford my fee, but I tell myself that the price for my product is a necessary component for my business to stay in existence! If my products were free, pretty soon there wouldn’t be any products. Before I gave The Graduate Student’s Guide to Personal Finance for the first time, I presented it to several audiences of family, friends, and colleagues at varying stages of drafts, incorporating their feedback after each session. Now, I ask my hosts to send out feedback forms after each event. I carefully comb through the student responses for constructive criticism that I use to improve the presentation for the next time I give it. The vast majority of the criticism I receive is that the presentation didn’t have time to really delve into one subject matter or another of interest to the student. Seeing this pattern spurred me to create my suite of four in-depth talks, wherein I expand on all the subject matter in my comprehensive talk and a few more areas. Other questions that the students say were left unanswered have inspired me to create new articles and videos for my website. Potential clients said some pretty discouraging things to me early on. Everyone is on board with the subject matter, but my prices were literally laughed at on more than one occasion. I was also told that my website was unacceptably unprofessional. (These people were nice about their criticism, giving it to – in their minds – help my business.) However, I pushed through and kept asking for what I want. Eventually, more and more people took my prices seriously (and a few gave me confirmation that they were in line with similar services) and complimented me on my website and other aspects of my communication style. The criticism became a small fraction of the types of reactions I received, though I only slightly adjusted my prices and website. I’m glad I listened to the criticism and made some changes around the edges of what I offer without letting it drive me out of my endeavor. Even though I’m not being laughed at any longer, I still get rejected. A lot. I get rejected right out of the gate and I get rejected after cultivating a client relationship through many calls and emails over several months. Most of the time, the rejection is phrased very nicely and explained (well, when my emails are returned at all! ), but it is still a rejection. I knew from the start that I didn’t need a “yes” everyone to make this business function – only a small fraction, really – but I’ve learned to take rejection in stride and, as much as possible, leave the door open for a continuing relationship and future engagement. While a few potential clients have lamented my lack of professional certifications, most see my status as a former graduate student as a great advantage in presenting this kind of material. I am thoroughly knowledgable about the challenges my audience experiences, having lived as my audience for seven years and learning lots more about their challenges thought my websites and conversations with potential clients. What I have been learning about in the past few months and will continue to is my potential clients – the graduate student government groups and administrators in graduate schools and financial aid offices. I attended a conference recently at which I spoke with lots of graduate student government leaders, which allowed them to speak more candidly with me about their objectives and challenges than they generally do over email. I hope to attend a similar conference with staff members in the spring to learn more about them as well. As I’m only one year into this business, and really only seven months into doing it full-time, I know I have a lot of developing and growing ahead of me. Some more experienced speakers or business owners (especially in other niches) might disagree with some of these lessons, and if so I welcome the feedback! But I hope that other entrepreneurs found one good takeaway point among my hard-fought lessons. What is really lacking in my business now (and therefore my big goal for this upcoming year) is to network with other people serving graduate students and PhDs. I only made a few new connections this year. There are a surprising number of career coaches for PhDs, most for leaving academia but some for staying as well, and also writers and other kinds of professionals. I want to get to know a handful of them, particularly those who are also solopreneurs! 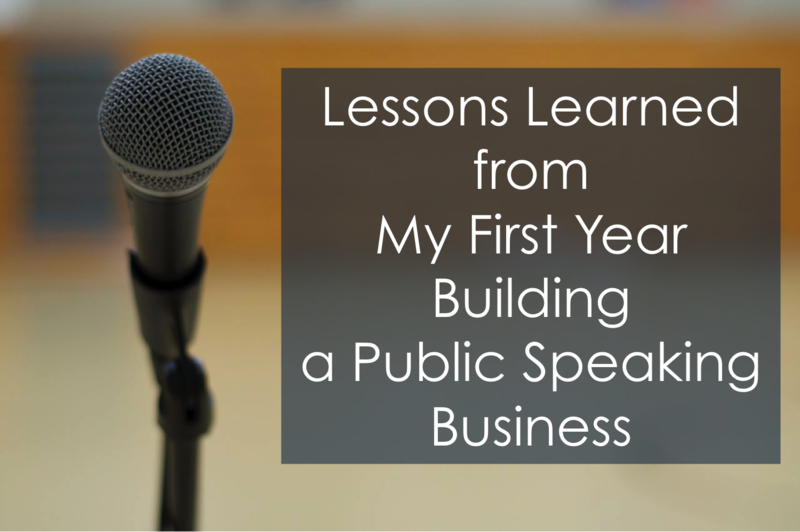 12 Responses to "Lessons Learned from My First Year Building a Public Speaking Business"
I’ve been doing some (paid) public speaking as well. I love it but it does take more work than some people realize. Congrats on your 1 year mark! Thanks and congratulations to you, too! Who are you speaking to? Do you travel or is it local? Which of these lessons do you consider the most important, Emily? Why? Congrats on this one. Good job Emily. I’ve been wanting to be a public speaker as it is really fulfilling especially when the speaker has made an impact on his audience. My mother is a professor and she does hold a conference. She always says that the reason why she loves doing it is the fact that she can impart knowledge with people and change their perspective in a positive way. I think that’s also your goal, Emily. Congrats. Nice Emily! I wish you may have many more years of experience in being a public speaker! Good luck! Congrats on your 1 year anniversary! I know having public speaking business is really hard to do and very fulfilling Emily! I wish you may have more years to come. Feedback is really important because it tells us whether they like it or not and some improvement we could do so that the next time, we’re better. Congrats Emily! I know that you received feedback and criticism to the way you do public speaking. And, I know you’re glad about those because you have become a better public speaker. Good luck! More years of this, Emily. Happy New Year. "[…] Personal Finance writes Mini-Vacation Financials: Wedding in Los Ang…"
"[…] @ Evolving Personal Finance writes The US Airways® Premier World Mast…"
"[…] October and November 2017 Budget Report […]…"
"[…] December 2017 Budget Report […]…"
and I pay only $25/month!